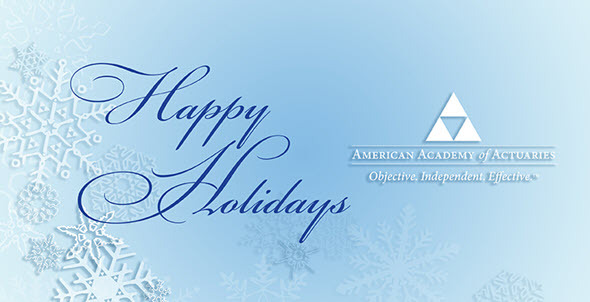 Editor’s Note: The Academy’s office will be closed Monday and Tuesday. Because of the federal holidays, the next issue of This Week will be published on Friday, Jan. 4. 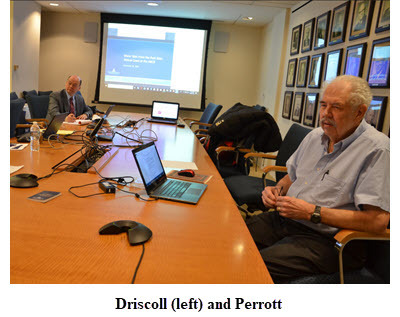 The final professionalism webinar of the year, “More Tales From the Dark Side: Ethical Cases at the ABCD,” held on Thursday, offered more insight from Actuarial Board for Counseling and Discipline (ABCD) members David Driscoll and Godfrey Perrott on ethical issues faced by practicing actuaries. The two drew upon staples of popular culture to provide entertaining and enlightening examples of professionalism issues that have come before the ABCD, and the request for guidance process, which allows actuaries to receive confidential guidance. Slides and audio are available free to members. The Academy hosted a webinar, “Big Data and the Role of the Actuary,” on Wednesday, drawing on the Academy’s Big Data Task Force monograph of the same name that was released earlier this year. Panelists discussed current and emerging practices, important regulatory and professionalism considerations, and the current state of the InsurTech field. Slides and audio are available free to members. The Academy and the Society of Actuaries (SOA) hosted a jointly sponsored life webinar, “Emerging Underwriting Methodologies in a PBR World Webcast,” on Tuesday, discussing work on the SOA’s Delphi study on emerging underwriting methods and their impact on mortality experience and ongoing work with regulators around that study. The December HealthCheck includes reports on a comment letter from the Individual and Small Group Markets Committee about administration guidance regarding state innovation waivers under Section 1332 of the Affordable Care Act (ACA); an Employee Benefits Committee and Individual and Small Group Markets Committee comment letter to the administration on a proposed rule regarding health reimbursement arrangements; a Health Practice Council letter to the Centers for Medicare and Medicaid Services about the Medicare Advantage program; and state and federal legislative, judicial, and regulatory activity. The Life and Health Valuation Law Manual can now be preordered online. The redesigned manual, updated annually, is intended to help appointed actuaries know the requirements of the NAIC model Standard Valuation Law and the Model Actuarial Opinion and Memorandum Regulation and the specific aspects of those models adopted by states. It will be available for delivery in the beginning of the year—preorder your copy today. The Retirement System Assessment and Policy Committee submitted a comment letter to the Department of Labor on the definition of “Employer” under Section 3(5) of the Employee Retirement Income Security Act (ERISA). The Individual and Small Group Markets Committee submitted comments on the October guidance from the departments of the Treasury and Health and Human Services on State Relief and Empowerment Waivers under Section 1332 of the ACA. The Health Practice Council submitted a letter to the Centers for Medicare & Medicaid Services (CMS) in response to its request for comments on proposed rules pertaining to the Medicare Advantage program, in particular provisions to revise the risk adjustment data validation payment error calculation methodology and process. The Academy submitted a comment letter addressed to U.S. House leaders and sent to all House members on The Retirement, Savings, and Other Tax Relief Act of 2018 and the Taxpayer First Act of 2018. The Intersector Group released notes of its April 2018 meeting with the Treasury Department and the Internal Revenue Service. The Financial Stability Oversight Council (FSOC) published its 2018 annual report, which provides an overview of FSOC’s activities, as well as significant financial markets and financial regulatory developments over the past year, including insurance and accounting regulations and standards, along with an assessment of those developments on the stability of the financial system. Read the alert. CMS announced that a total of 8.5 million Americans enrolled in health care coverage for 2019 through the federal health insurance exchange established by the Affordable Care Act. This marks a slight decline from last year’s numbers, when 8.8 million Americans enrolled for health care coverage through the federal exchange, and a 15.4 percent decline of new consumers. Read the alert. A federal judge for the U.S. District Court for the Northern District of Texas issued a decision in Texas v. Azar late last Friday, declaring the individual mandate for health insurance coverage to be unconstitutional and further that it cannot be severed from the rest of the Affordable Care Act, thus making the entire law invalid. Read the alert. Enrolled Actuaries Meeting—April 7–10, 2019, Washington, D.C.
PBR Boot Camp—April 8–10, 2019, Orlando, Fla. Early registration deadline is Jan. 31. Annual Meeting and Public Policy Forum—Nov. 5–6, Washington, D.C.